A good friend recently passed this interesting little record from 1956 my way and I thought the followers of the Scratchy Attic might enjoy it. I have been collecting 10" LPs on the Solitaire Manhattan label for many years, mostly period pop fare. The label was the product of a Toronto company that also produced many 78rpm EPs for the budget market, manufacturing the cheapest records sold in Canada pressed on material that by its sound and appearance, might well have been ground up bowling balls! Most, if not all, of said 78 EPs featuring country material were sourced from Rite Record Productions of Cincinnati, Ohio, as is this LP. It is the first Country collection I have seen on the Solitaire Manhattan label, although I discovered at least one other title, "Songs Of The West", Solitaire Manhattan SRO-110, at rateyourmusic.com. 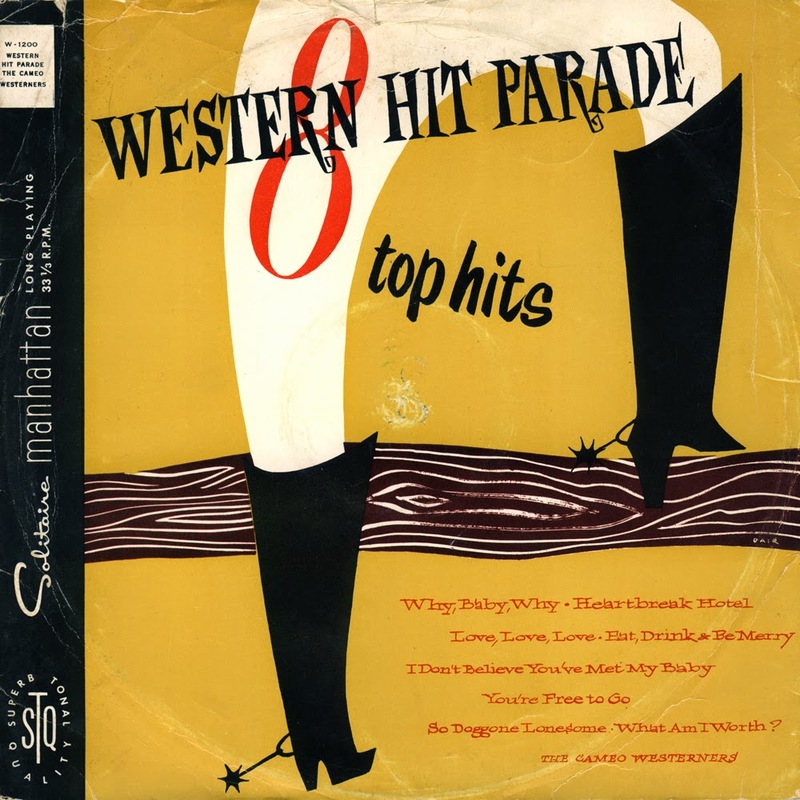 The album credits "The Cameo Westerners" as the artist (as does SRO-110), however, of the eight tracks, five feature the fantastic honky-tonk voice of Delbert Barker, one is by Glen & Vivian Watson (a track that has at times been credited, I believe incorrectly, to Delbert Barker) and two tracks on which the artist is unknown, at least to me. I can find no listings online for a Rite/Gateway etc. release of the George Jones tune "What Am I Worth", and the version of "Heartbreak Hotel" on this LP is NOT the version by Delbert Barker also in the Rite catalogue. When I first saw the LP I thought perhaps these two tracks were George Jones Starday masters farmed out on the sly (not unheard of) but they both turned out to be sung by a an unidentified female vocalist, and are distinctly Rite productions. Of course, if anyone has any discographal information on theses tracks, please feel free to leave a comment. Thanks to Stephen of Cedar Island for passing this wonderful little disc along! A great site with a history and discography of Rite Record Productions is here. 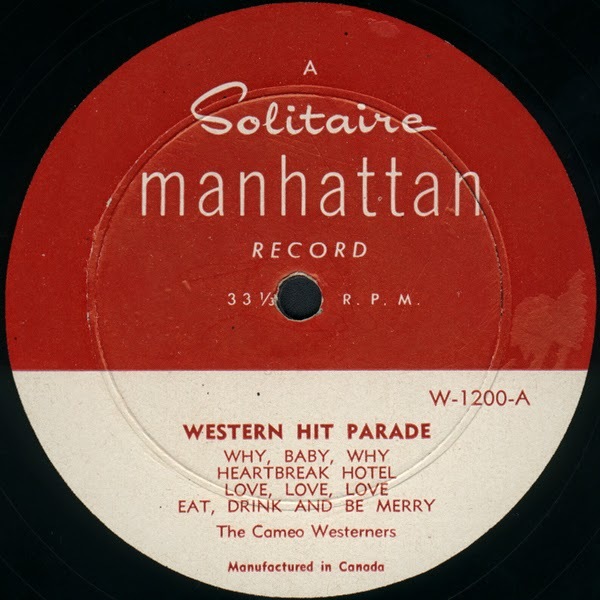 Please note that Solitaire Manhattan LPs were pressed on very poor material of a grade generally used on low-end 78s, and are therefore very noisy. However, I felt this material is rare enough to overcome the shortcomings in sound. The reproduction here is more like what you might expect from a cheaper 78 from the era.